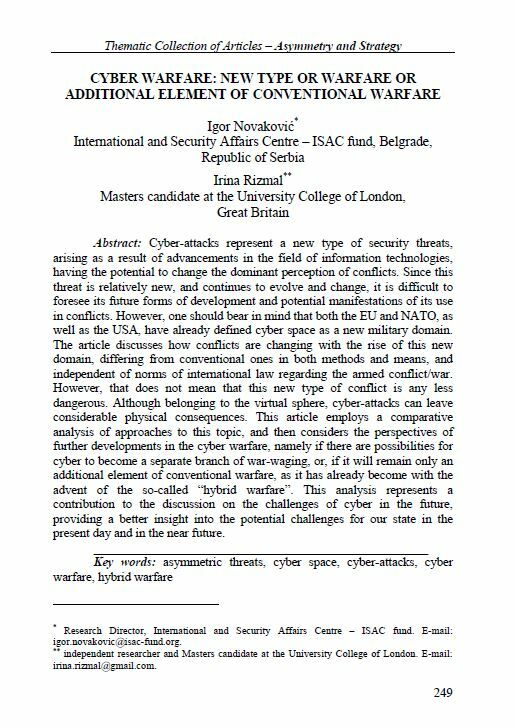 This article employs a comparative analysis of approaches to the topic of cyber warfare, and then considers the perspectives of further developments in the cyber warfare, namely if there are possibilities for cyber to become a separate branch of war-waging, or, if it will remain only an additional element of conventional warfare, as it has already become with the advent of the so-called “hybrid warfare”. This analysis represents a contribution to the discussion on the challenges of cyber in the future, providing a better insight into the potential challenges for our state in the present day and in the near future. In cooperation with the ISAC Fund, the Official Gazette of the Republic of Serbia has published the book by Michel Foucher L’Union européenne un demi-siècle plus tard: état des lieux et scénarios de relance, translated into Serbian by Prof. dr Predrag Simić. In the period from 2005 to 2009, as a result of the unfavourable outcome of the referenda on the Treaty establishing a Constitution for Europe in France and the Netherlands, and the rejection of the Lisbon Treaty in Ireland, the EU has undergone a deep institutional and political crisis. These events triggered a broad debate within the EU member states on the issues of institutional reform, and the challenges to the EU’s Economic, Enlargement and Neighbourhood policy. Michel Foucher’s book is the result of the research on this debate regarding EU’s reform and future prospects. The publication is available in bookstores and the online store of the Official Gazette. With the kind help from the Royal Danish Embassy in Belgrade and the Ministry of Defence of the Kingdom of Denmark, the ISAC Fund publishes the Compendium consisting of nine notable lectures of international and domestic experts given at the 9th School of Security Sector Reform, held in Belgrade, in April 2007.